Charlie Chaplin soon created his famous character 'the Tramp' and appeared in the silent films Kid Auto Races at Venice, and Mabel's Strange Predicament. 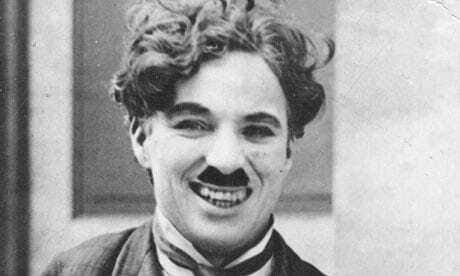 Charlie Chaplin was born on 16 April 1889 in Walworth, London, United Kingdom just four days before Adolf Hitler. Charlie started working with a dancing troupe called the Eight Lancashire Lads in 1897. He was the first actor to appear on Time magazine. Charlie Chaplin's older brother Sydney also became an actor. He got married 4 times. Charlie Chaplin's success in film lasted for several years, but in the 1950s he was attacked by right wing conservatives for moral reasons and left the United States. When Charlie's mother was institutionalized in 1898 Charlie and his older brother went to live with Charles Sr., who died two years later from alcoholism. While trying to become an actor Charlie Chaplin also worked a variety of jobs to survive including being a newspaper vendor, doctor's boy, toy maker, and printer. Charlie Chaplin's success grew and he was allowed to star in and direct Caught in the Rain in 1914. He portrayed Adolf Hitler in "The Great Dictator". Charlie Chaplin's first role in a play was as a newspaper boy in Jim, a Romance of Cockayne, which opened in 1903. He won one Oscar award for the movie "Limelight" in the best music category. Charlie Chaplin's next role in a play was as Billy, a pageboy, in Sherlock Holmes. In 1972 Charlie Chaplin received an honorary Academy Award. Charlie Chaplin created approximately one short silent film each week in 1914 after the success of Caught in the Rain. His own daughter, the actress Geraldine Chaplin, portrayed his on screen mother in the movie, " Chaplin ". In 1906 Charlie Chaplin joined Casey's Circus, a juvenile act that lasted until 1907 when Charlie was 18 years old. He had already become known for his comedic style. The only color film Charlie Chaplin ever made was the 1967 film A Countess from Hong Kong. Due to suspicions of him being a communist, his imprints were removed from the Hollywood walk of fame and have been lost subsequently. Charlie Chaplin's older brother Sydney helped him become part of Fred Carno's comedy company in 1908. By 1909 Charlie was in starring roles because of his ability and popularity. Charlie Chaplin died on December 25th, 1977 at the age of 88.
robbers were captured. He is now buried under 6 feet of concrete to prevent further theft attempts. Charlie Chaplin was sent to North America to tour the vaudeville circuit with other members of Fred Carno's comedy company. The tour ended in 1912. At the age of 26 Charlie Chaplin's success allowed him to earn a salary of $670,000 a year. Charlie Chaplin never became a U.S. citizen and was exiled from the U.S. in 1953 because he refused to have the American citizenship. He lived in Switzerland during his exiled years and died during sleep there in Vevey, Vaud on December 25, 1977 at the age of 88. Charlie Chaplin's first film was called Making a Living, which was released on February 2nd, 1914. The Tramp was characterized by a small moustache, a black hat, a tight coat, and baggy pants.